318 pages | 11 B/W Illus. This book considers the full sweep of Haitian community invention and recreation in a multitude of national territories, with an eye toward the "place" factors that shape the everyday lives of Haitian migrants. Regine O. Jackson brings together an interdisciplinary group of scholars to explore how Haitian communities differ across time and place, as well as how migrants adjust to new economic, political and racial realities. The volume includes descriptive ethnographies of Haitians in 19th century Jamaica, eastern Cuba, Detroit, the Dominican Republic, Guadeloupe, Paris, and Boston, and innovative scholarly work on non-geographic sites of Haitian community building. The most important question addressed here is not whether the places described represent typical or exceptional Haitian diasporic communities, but how, why and to what effect do Haitians in particular places use diaspora as a signifier. By examining the diversity (and sameness) of the Haitian experience in diaspora, Geographies of the Haitian Diaspora asks how we might situate community in view of increased scholarly attention to transnational processes. List of Figures. List of Images. List of Maps. List of Tables. Foreword: Locality, Globality and the Popularization of a Diasporic Consciousness: Learning from the Haitian Case Nina Glick Schiller. Acknowledgments. Introduction: Les espaces Haïtiens: Remapping the Geography of the Haitian Diaspora Regine O. Jackson Part I: Lateral Moves 1. From the Port of Princes to the City of Kings: Jamaica and the Roots of the Haitian Diaspora Matthew J. Smith 2. The Dialectic of Marginality in the Haitian Community of Guadeloupe, French West Indies Paul Brodwin 3. The Onion of Oppression: Haitians in the Dominican Republic Samuel Martínez 4. On the Margins: The Emergence of a Haitian Diasporic Enclave in Eastern Cuba Yanique Hume 5. Between Periphery and Center: The Transnational Practices of Haitian Migrants in The Bahamas Ermitte St. Jacques Part II: Siting Diaspora 6. Mediating Institutions and the Adaptation of Haitian Immigrants in Paris Margarita Mooney 7. 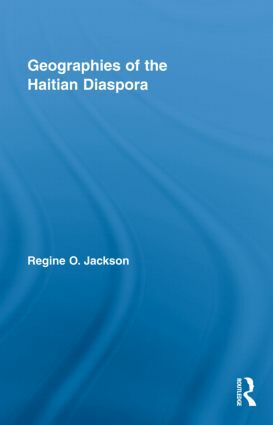 The Uses of Diaspora among Haitians in Boston Regine O. Jackson 8. Haitian Migration and Community-Building in Southeastern Michigan, 1966-1998 Chantalle F. Verna 9. Deporting Diaspora’s Future? Forced Return Migration as an Ethnographic Lens on Generational Differences among Haitian Migrants in Montréal Heike Drotbohm Part III: Diaspora as Metageography 10. Listening for Geographies: Music as Sonic Compass Pointing Towards African and Christian Diasporic Horizons in the Caribbean Elizabeth McAlister 11. The Reproduction of Color and Class Hierarchies in Haitian Bilingual Classrooms Fabienne Doucet 12. Language, Identity and Public Sphere in Haiti’s Diaspora: The Evolution of the Haitian Creolists’ Internet Network Angel Adams Parham 13. Going Home Again and Again and Again: Coffee Memories, Peasant Food and the Vodou Some of Us Do Gina Athena Ulysse. Contributors. Bibliography. Index. Regine O. Jackson is Assistant Professor of American Studies at Emory University. Routledge Studies on African and Black Diaspora is designed as a forum that confronts established academic boundaries in the study of social, cultural and political history of people of African descent while at the same time exploring the contours of knowledge production and understanding about Africa and its diaspora through rigorous and critical scrutiny. The series marks a critical development in publishing theoretically and historically significant works on the lived experiences of people of African descent in all parts of the world. The series publishes original works of the highest quality from across the broad disciplinary fields of social sciences and humanities with a strong emphasis on theoretically informed and empirically grounded texts. Focus issues include the centrality of power and resistance, knowledge production, gendered cartographies, memory, race, class and other aspects of social identity in exploring different dimensions (cultural, geographic, political, social and psychological) through which people of the African descent have moved in the context of globalized and transnational spaces.